This book is about emptiness, the core of the Buddhayâna, the ‘vehicle’ of the Buddha. Shûnyatâ is the noun form of the adjective 'shûnya', meaning ‘void, zero, nothing and empty’, from the root 'shi', or ‘hollow’. But emptiness does not mean ‘nothing’, and instead refers to the absence of something, to the fact an object has been negated, is deemed not to be present and nowhere to be found. The zero is not mathematical, as if emptiness would be nothingness, but stands for a second order, pointing to what is not there amongst what is given. What is found wanting ? A certain common way of existence entertained by most of us ... 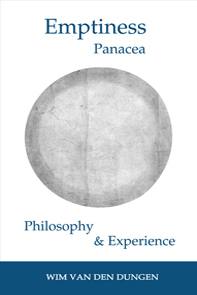 The text covers the philosophy, logic and experience of emptiness. "If there were no such things as dichotomies that exclude a third category, there would be no way to make a refutation with analysis that limits the possibilities to two, (asking) whether it is asserted that something exists or does not exist, or is one or many, and so forth. If there are (dichotomies that exclude a third category), then when something is refuted as being one side of a dichotomy and it is not established as the other, it does not exist. (...) if something is eliminated as being one side of a dichotomy, it must be established as the other and that if one is refuted, the other is established." 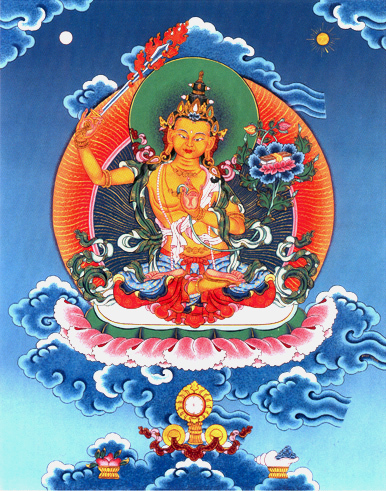 Tsongkhapa : Extensive Explanation of "Supplement to 'Treatise of the Middle Way'", chapter 6, definite enumeration as only two truths. "In the seen there is only the seen ; in the heard, there is only the heard ; in the sensed, there is only the sensed ; in the mentally perceived, there is only the mentally perceived." In Buddhist philosophy, ultimate logic is the formal exposition of the arguments of ultimate analysis. Instead of conventional analysis, differentiating between conventional realities like sense objects & mental objects, ultimate analysis poses the fundamental question of both epistemology & ontology, namely : What is exactly & truly there ? In other words, what is the precise status of objects and how true is this status ? The first question answers what kind of objects we are dealing with and the second tells us what kind of validity they possess. Being able to answer both questions for all possible objects of experience is the first step in acquiring a conceptual understanding of the wisdom realizing the true nature of all phenomena. And to fully enter this wisdom, contrived (by way of concepts) and uncontrived (by way of direct, i.e. nonconceptual, nondual seeing), is the core of Buddha Śâkyamuni's teaching. To make a clear cut, I've kept the technical elaborations at the minimum. No doubt this exposition will be expanded in the future. The present ultimate logic is not a formal logic of the ultimate, but a tentative formalization of its conceptual approximation. It ends with identifying proximate emptiness on the basis of a generic idea of emptiness, i.e. a very subtle conceptualization of the ultimate nature of all phenomena.